since its launch in January 2009. Top Contributors are Google-recognized participants of our help forums who exemplify excellent product knowledge, are consistently kind and respectful to others, and are helpful in the forum. He’s an avid user of Google Sites both professionally and personally, and creates and manages Google Sites for other businesses. His website (www.steegle.com) contains many FAQs and how-tos for Google Sites and receives 30,000 visits per month. 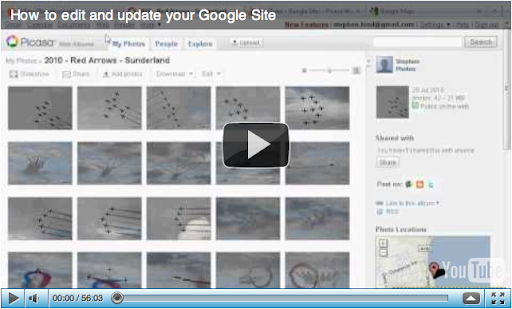 I began using Google Sites when it was first released for Google Apps in February 2008. When I created my first site, I saw that Google Sites offered the features I wanted on any site: a navigation gadget; a breadcrumb trail; a hierarchical structure; a simple editor; and a configurable look and feel. Since then, I’ve been offering support to other users because I enjoy helping others get the most out of their sites. add gadgets for maps, contact us forms and videos. After the presentation I held a Q&A session. Two questions surfaced in every session: “Why does my site not appear in Google Search?” and “How can I see how many people have visited my site?” I answered these by explaining how to register a Google Site with Google Webmaster Tools and demonstrating how to add Google Analytics to the site. It was great to offer these simple tips to help attendees guarantee the success of their own sites. It was a wonderful opportunity to show others how Google Sites provides an easy and quick way to create informative and reliable websites. The feedback I received, and continue to get, gives me great encouragement to continue to help the Google Sites community, and I look forward to future opportunities to increase Google Sites usage. Guest post: Stephen Hind (commonly known as Steegle) has been a Top Contributor in the Google Sites help forum since its launch in January 2009. Top Contributors are Google-recognized participants of our help forums who exemplify excellent product knowledge, are consistently kind and respectful to others, and are helpful in the forum. He’s an avid user of Google Sites both professionally and personally, and creates and manages Google Sites for other businesses. His website (www.steegle.com) contains many FAQs and how-tos for Google Sites and receives 30,000 visits per month.